Many Americans will undergo chemotherapy treatment at some point during their lives due to developing cancer. Chemotherapy is a common cancer treatment that often involves several rounds of controlled exposure to powerful drugs that target the cancerous cells. However, the side effects of chemotherapy can leave you unable to work for weeks or months at a time. Fortunately, though, you may be able to seek long-term disability benefits while you recover from chemotherapy treatment. If you have questions about long-term disability and chemotherapy, do not hesitate to contact an Indiana long-term disability lawyer at Hankey Law Office We help clients file for disability coverage for a variety of temporary and permanent disabilities. You can reach our helpful and knowledgeable staff at (800) 520-3633 today. These consequences of chemotherapy can make it difficult or even impossible to fulfill your work obligations. They may constitute a form of temporary or long-term disability. If you are undergoing chemotherapy and wish to file for disability compensation, you will need to meet certain qualifications and deadlines. An attorney may be able to help you through this complicated process. 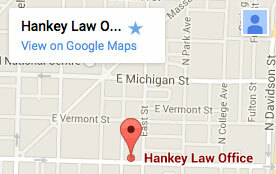 The Hankey Law Office, helps clients seek the long-term disability payments they need. Our experienced team of Indiana long-term disability attorneys may be able to assist you in filing for chemotherapy-related disability coverage. To learn more, please call us today at (800) 520-3633.